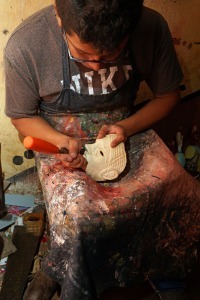 A carver in a Chichi morería prepares a vaquero (cowboy) mask. Guatemala is a country as rich in masking traditions as in volcanic soil. Chichicastenango, or Chichi as it is called by locals, is a small town located in the El Quiché department of southwest Guatemala. Its population of about 45,000 is almost entirely Mayan K’ich’e (Quiché). Most of the year, the town is quiet and uneventful, but during several major holidays, the town comes alive, tripling in population from the surrounding neighborhoods. The most famous festival in Chichi is the Fiesta de Santo Tomás, in honor of the town’s patron saint. The Fiesta occurs in mid-December every year, and lasts a full week. It is organized by a cofradía, or honorable fraternity of town elders. 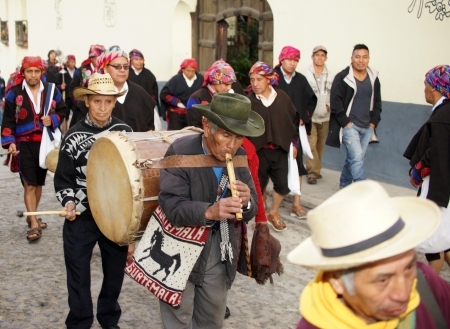 The parade of the cofradía through the town toward the church, accompanied by flute and drum music, marks the beginning and end of the festival. In the Baile del Tzijolaj, a member of the cofradía dances carrying a St. Thomas icon. During the celebration, icons of St. Thomas, the Virgin Mary, St. Joseph, St. Sebastian, and other saints are paraded through the streets with currency attached to them, accompanied by taper-bearers, marimba and flute players, and men who set off loud fireworks. 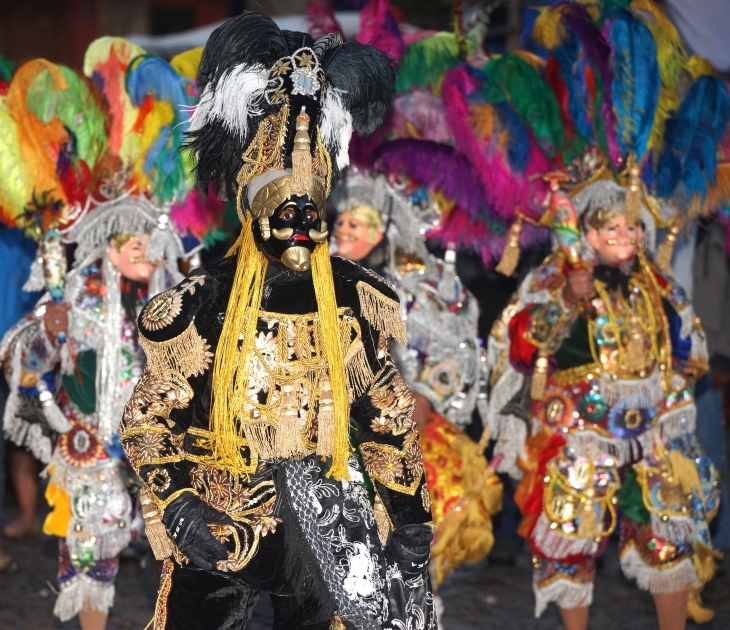 Also accompanying the saints is the important Baile del Tzijolaj, or Dance of the Flute, during dancers known as Aj Kam carry a small wooden figure, with a necklace of coins, mounted on a white horse. The figure represents St. Thomas and is believed to confer prosperity on the town. 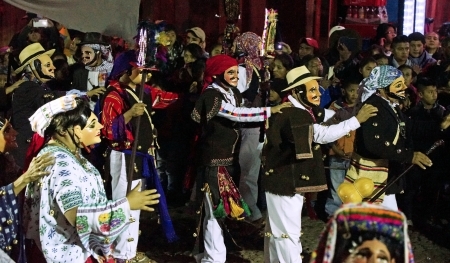 In addition, the Fiesta includes several different dances and rituals, nearly all of them masked. In the Baile del Torito, the dangerous little bull may represent Spain symbolically. The most prominent dance is the Baile del Torito (Dance of the Little Bull), held in the town square and accompanied by the music of a marimba band. The dance dates back to the 17th century. It tells the story of a cattle ranch in which the caporal or mayordomo (foreman) prohibits the vaqueros (cowboys) to interact with a bull. The cowboys get the foreman drunk and perform bullfights. Eventually, a bull kills the foreman and the dance ends. It is possible that the bull was intended to symbolically represent Spain and the dangers it posed to the indigenous peoples, represented by the cowboys. The dance frequently begins before sunrise and lasts for up to 12 hours. It may be performed for many days, sometimes over a week. In Chichi, there are usually several bulls and caporales, and up to 50 vaqueros. The caporales are alternately white and black. The costume of the vaquero is brightly colored and elaborate, with a hat sporting thick clusters of dyed ostrich feathers, and he carries a cape and painted maraca (rattle). The players of each character are chosen through Mayan rituals and are blessed by an Ai-lj (Mayan priest) before the dance. The Baile de los Mexicanos (Dance of the Mexicans) is a disguised adaptation of an ancient Mayan fertility ritual, banned by the Catholic Church. The dancers appear to parody Mexicans, wearing huge sombreros and masks with long nose, and dancing while carrying snakes (usually a nonvenomous variety). Like the Baile del Torito, the Mexicans are accompanied by a marimba band. A caporal (boss) leads the vaqueros (cowboys) in the Baile del Torito. 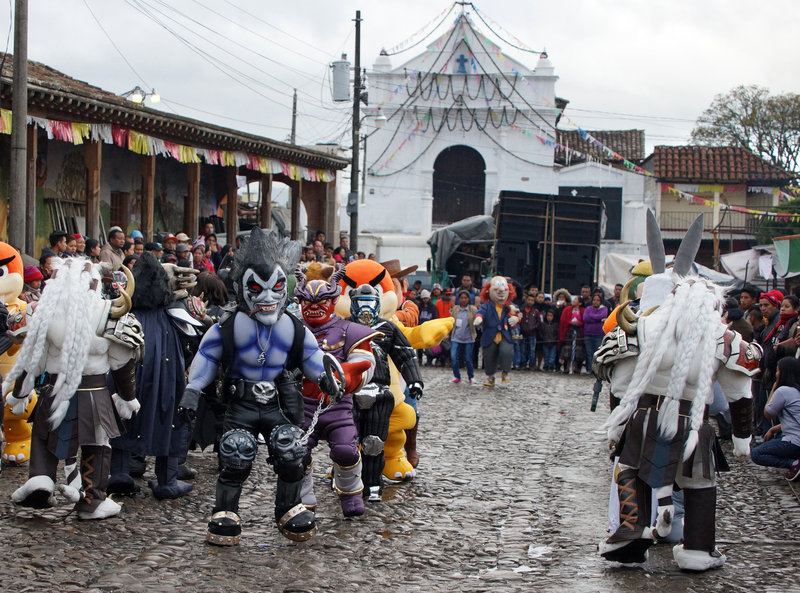 The Baile Típico (Typical Dance), also known as the Baile Regional (Regional Dance), parades around the village as a large group of masked men and women (frequently men dressed as women), carrying large tapers, flowers, and canes. Unlike most other dances, the Baile Típico is usually danced to modern music broadcast from a loudspeaker. The masks and costumes represent normal K’ich’e Mayan peasants, and they dance vigorously in a group led by a capitán (captain) with a whistle to signal changes in choreography. The dance lasts approximately 15 minutes, then the dancers move on another part of the town, refreshing themselves in taverns and guest houses as they go. The Baile Típico of Chichicastenango. The female masks are almost all being worn by men. The convites represent characters from popular culture rather than traditional themes. 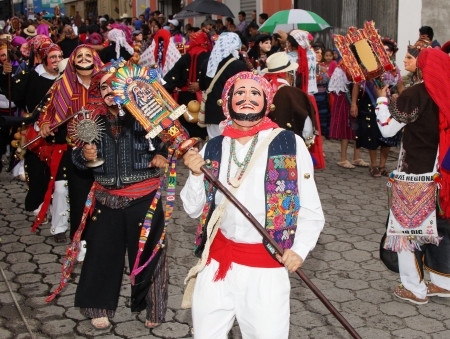 The Baile de los Convites (Dance of the Invited Persons) is a ceremony that dates to the Spanish colonial period, but is probably the most mutable of all Guatemalan dances. The dance is performed on the annual holiday in honor of a town’s patron saint, and its name probably derives from the fact that celebrants from surrounding villages were invited to participate in larger towns. It is unclear why masks and costumes became part of the dance, but the characters began as crude, handmade masks, and rapidly evolved to mimic characters from popular culture, including television, motion pictures, and video games. Today, both mass-produced costumes and handmade costumes are used, often involving a considerable investment. In some places, these dances are thinly-veiled status rituals–the more impressive the costume, the greater the credit for the dancer. In the dance, capitanos organize the dancers into rows, and they dance in various configurations to the music of a marimba band. Unlike most other dances, there is no plot or story, nor is there a predetermined form to the mask. The jaguar, monkeys, and marimba player accompany the icons before flying from the pole. The most spectacular event of the festival is the Palo Voladores (Pole Flyers). 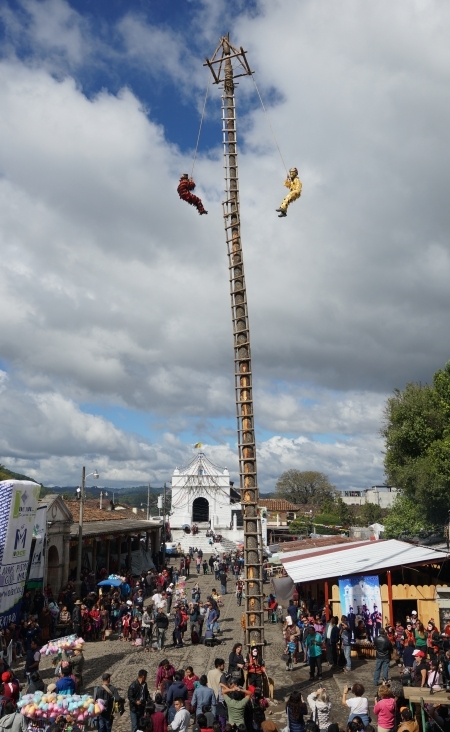 This ancient Mayan ritual begins with a very tall pole erected in the town square. 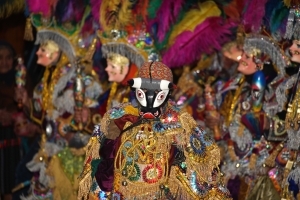 At its base, a group of masked dancers dressed as micos (monkeys) and a jaguar, dance to a marimba. Eventually, the micos and jaguar climb to the top of the pole, tie themselves to the top with ropes, twist the ropes around a pivot atop the pole, and swing on ropes in circles the pole while gradually descending to the ground. The process takes around six or seven minutes and requires exceptional courage, especially because the masks obscure the vision of the flyer. After several passes, volunteers from the audience are permitted to join the flyers. 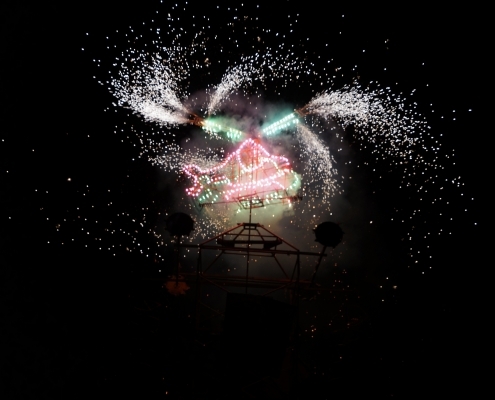 The celebration ends with fireworks in the town square, organized around skeletal structures to give them form. The resulting pyrotechnics may resemble the Church of St. Thomas, buses, helicopters, or anything else. 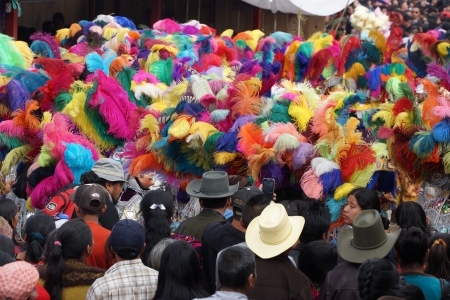 The Fiesta de Santo Tomás of Chichicastenango is a unique and exquisite event. 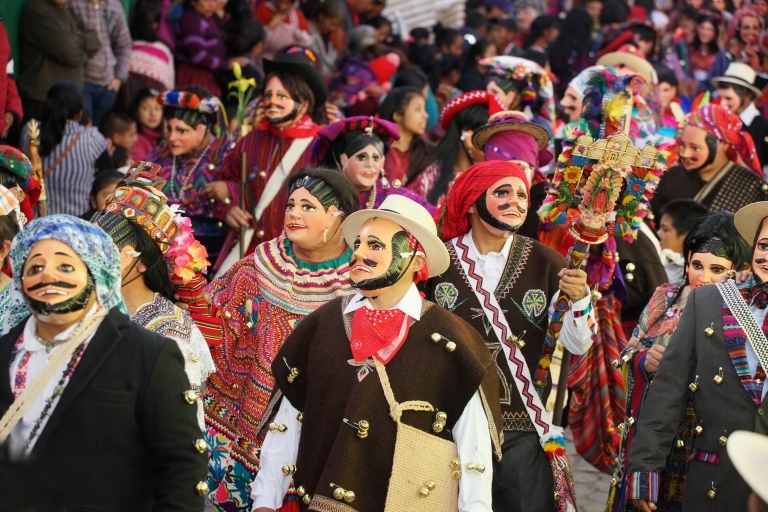 A spectator necessarily learns much during the festivities: The exceptional richness of Guatemalan culture; the adaptation of prehistoric rituals to modern circumstances; the huge diversity of masked rituals in even a single Guatemalan town; and, not least, the creative and fun-loving nature of the Guatemalan people. The cofradía of St. Thomas parades toward the town square, where they signal the start of the festivities. 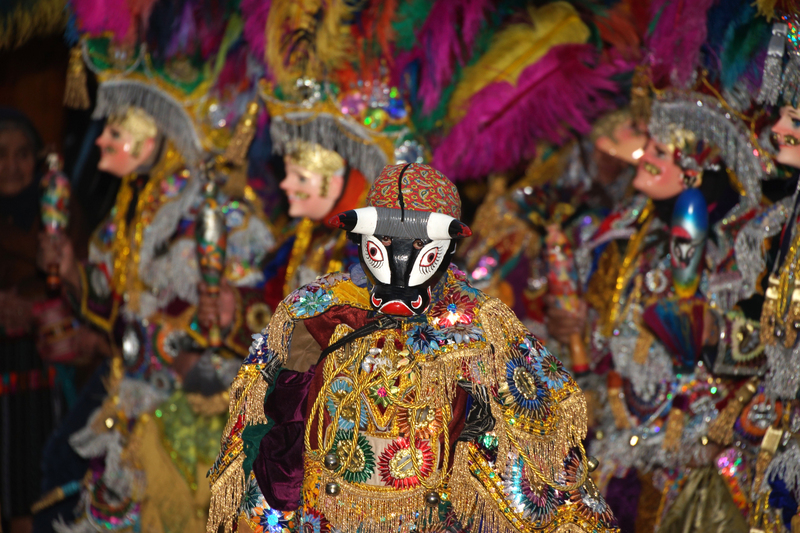 The elaborate costumes of the dancers are hand-sewn in a Chichi morería. An Aj Kam of the Cofradía performs a Mayan ritual on the church steps to bless the town and drive away evil spirits. Icons of the saints are carried through the streets of Chichi in procession toward the church. 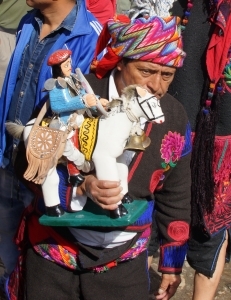 In Chichi, many plumed vaqueros participate in the Baile del Torito. In the Baile Típico, dancers commonly carry religious articles like tapers, reliquaries, and images of saints. The tireless dancers of the Baile Típico continue until late in the night. The jaguar and monkey dancers swing from the pole at a dizzying height above the town square. A moving pyrotechnic helicopter closes the evening’s festivities.